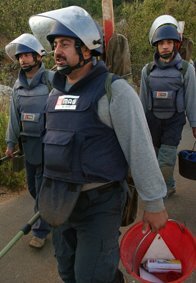 My friends at MAG have launched an emergency appeal to tackle the unexploded ordnance left behind following the fighting in southern Lebanon. MAG estimates that up to 10% of the bombs dropped failed to detonate and pose an immediate threat to life. The early days following a ceasefire in any war zone are often the most crucial for clearance teams. Displaced families start returning home, but they're often unaware of the dangers they face or where the worst affected areas are. Read more about MAG's work in Lebanon here. Just saw a news article that three Lebanese troops have been killed while clearing ordinance. So vital to keep drawing attention to this problem.